It is challenging to identify the “teachable moments” that arise in busy clinical settings. When a teachable moment is identified, few teachers can deliver eloquent lessons extemporaneously. The teaching script is a strategy that many exemplary teachers use to efficiently and effectively enhance learning in clinical settings. 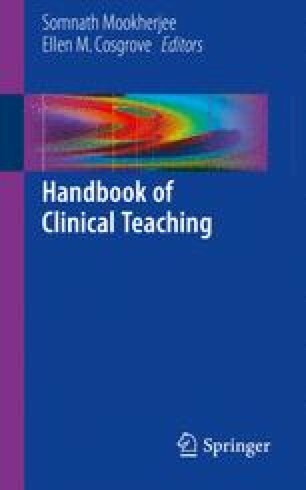 This chapter presents a strategy for being prepared for “teachable moments” by creating and using teaching scripts in the clinical setting. Irby DM. How attending physicians make instructional decisions when conducting teaching rounds. Acad Med. 1992;67(10):630–8. http://www.ncbi.nlm.nih.gov/pubmed/1388522. Marcdante KW, Simpson D. How pediatric educators know what to teach: the use of teaching scripts. Pediatrics. 1999;104(1 Pt 2):148–50. http://www.ncbi.nlm.nih.gov/pubmed/10390281.